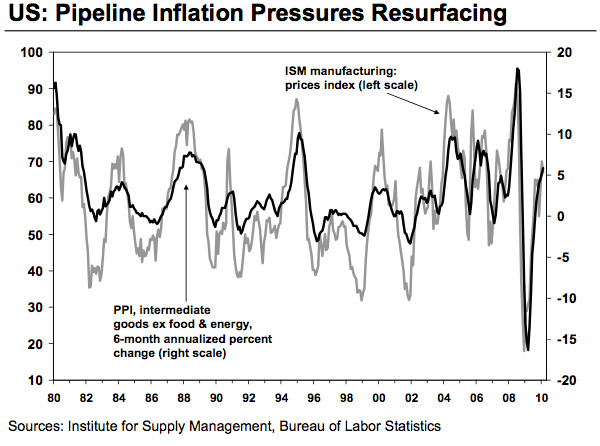 The latest Global Monetary Analyst from Morgan Stanley shows how manufacturing activity has tracked producer inflation (PPI, below) quite well historically, as shown below. 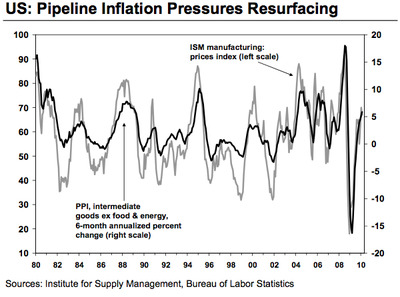 And the data at early stages of the processing pipeline support the story of eventually higher, not lower, inflation. The biggest upside risks come from factors that could promote increases in inflation expectations: significantly faster growth, intensified protectionism, or the Fed overstaying its welcome. Basically, easy U.S. monetary policy has left inflationary kindling all around the U.S. economy. A bit too much growth, combined with a too dovish of a Fed or a trade war, could set it all ablaze.